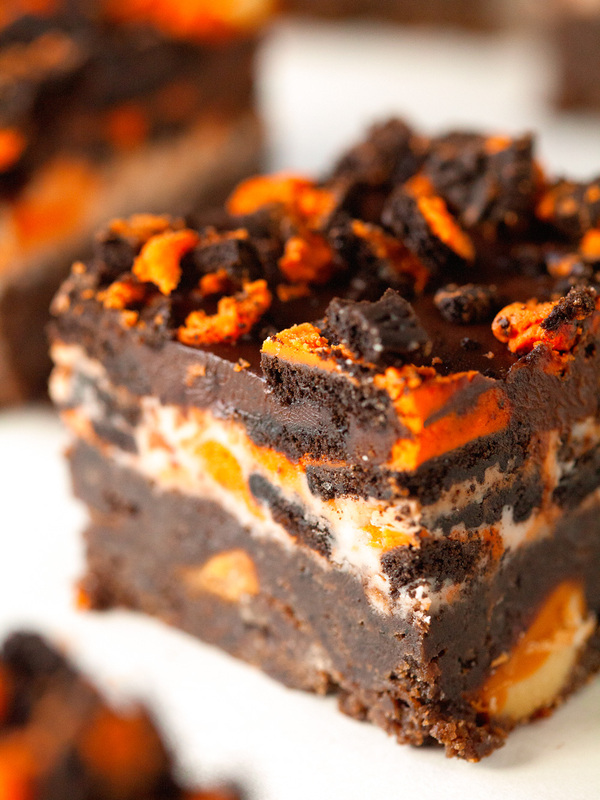 Brownies stuffed with Pumpkin Spice Kisses and topped with a layer of Cookies & Cream and Chocolate. These are dangerous – in the best possible way! Happy Friday, friends. I am so excited Friday is finally here. Not just because it’s the end of the work week and the weekend begins, but I finally get to share these brownies with you. It’s not like I had to wait an eternity to get around to blog these, but when you’re not the most patient person in the world, 5 days feels like forever. I know I could have switched things, but brownies and Fridays just go together. It all started when I tried Hershey’s pumpkin spice kisses a couple of weeks ago. I don’t know why, but I had never had them before. Which was a total surprise to me. Since I love anything pumpkin spiced and have pretty much tried everything available, I had not idea how the kisses escaped me. All I knew was that I needed to make a recipe that called for them and preferably didn’t use the whole bag ;). I needed to have a couple leftover to keep myself occupied while waiting for the brownies to cool and set. 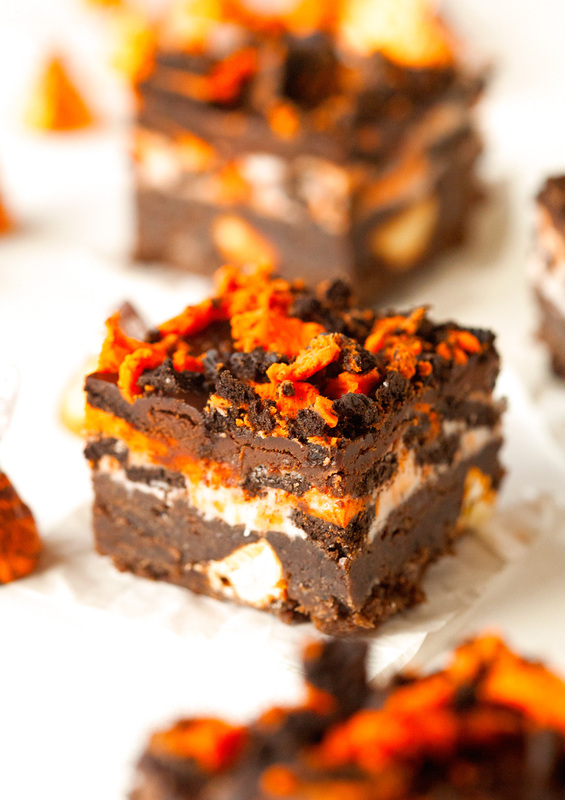 Now the brownie layer is thick, fudgy, and the perfect vehicle to showcase those pumpkin kisses. They give them a hint of pumpkin spice without being too overwhelming and still let the chocolaty goodness shine. A perfect match. I used Oreos for the next two layers and just wanted to mention that if you are not a pumpkin spice fan, you could add a couple of broken Oreos into the brownie batter as well. That way you’ll have the same color effect and add a little bit of texture to that rich layer. The cookies & cream layer comes together in no time. And so does the chocolate layer. As you can see, I didn’t hold back on the fall Oreos. I went to town – just the way I like it. There is a time to hold back and when little is more, but this is not it. These brownies need to be packed with as much deliciousness as possible. Trust me, you might want to thank me later. Goodness, I definitely know why I couldn’t wait to present these to you. This is one of those situations where I wish I could send each one of you a couple of these goodies. Good thing fall has just started, which means pumpkin spice kisses and these fun Oreos are around a little longer – I will be making many more batches this season! I hope you all have a wonderful first fall weekend ahead. XOXO. Fall-inspired Cookies and Cream Brownies. 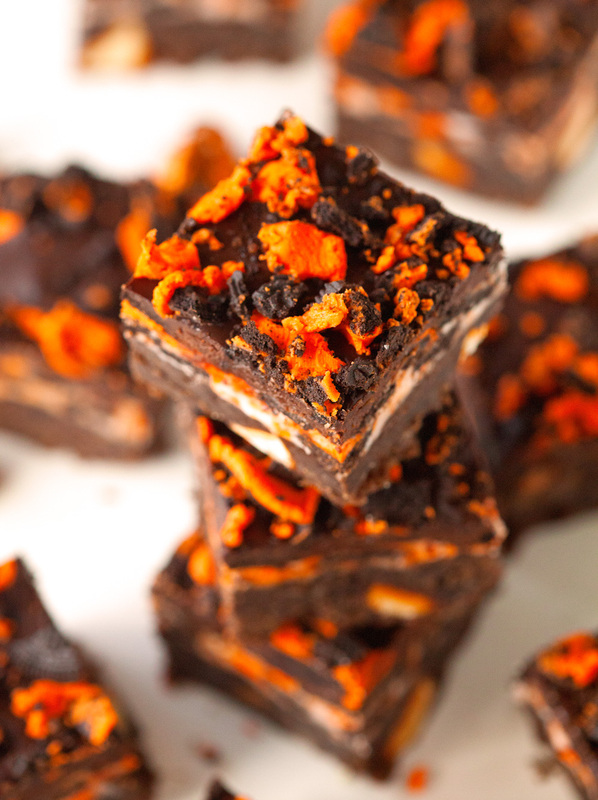 If you love fall flavors and brownies, then these bars are for you! A must-make this season! Preheat oven to 350 degrees F. Spray an 8-x-8-inch baking pan with nonstick spray. Set aside. 1. In a medium microwave-safe bowl, combine butter and chocolate chips. Heat in 30 second increments until completely melted and stir until fully combined. Add eggs and mix until incorporated. Mix in sugar and vanilla extract until smooth. Add cocoa powder, salt and flour and stir to combine. Fold in pumpkin spice kisses and pour batter into prepared baking pan. Place in the oven and bake for 30-35 minutes or until set. Let cool completely. 2. For the cookies and cream layer, mix together confectioners' sugar, butter and milk until smooth. Mixture should be slightly thick, but spreadable. Add more milk if frosting isn't thin enough. 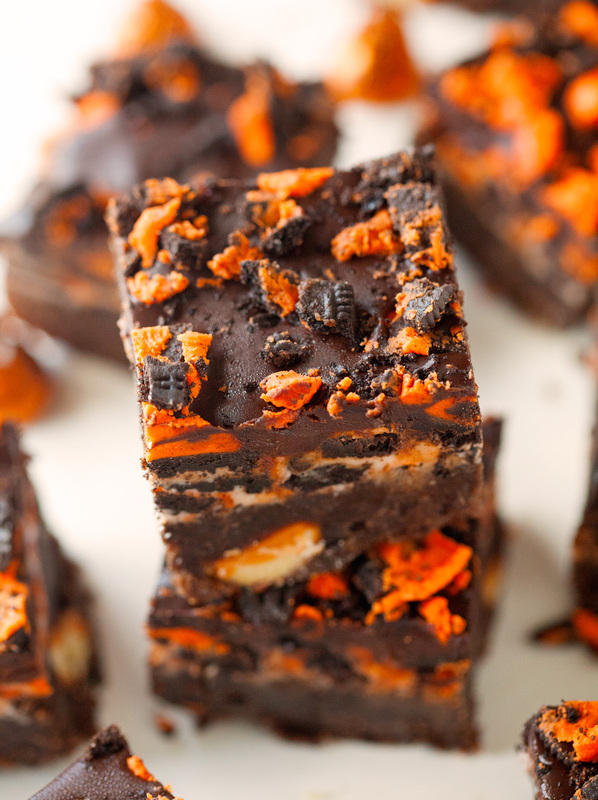 Fold in Oreo pieces and spread in an even layer on top of the cooled brownies. Place in the fridge while you prepare the chocolate layer. 3. In another medium microwave-safe bowl, combine chocolate and heavy cream. Heat in 30 second increments until smooth and no chunks remain. Add shortening or butter and stir until melted and incorporated. Spread chocolate mixture over the cookies and cream layer. Sprinkle Oreo pieces on top and refrigerate for at least 2 hours before cutting. Enjoy! Brownies will keep up to 3 days stored in an airtight container or up to 4 weeks in the freezer. What a great dessert for Friday, Kathi! I’m loving these festive brownies. And anything with cookies and cream is a winner in my book. Pinned! Totally agree, Gayle. Cookies and Cream is the best. Thank you, dear! Oh.My.Goodness. Those brownies are amazing with all those layers!! There is such a thing as pumpkin spice Kisses?! Ummm, that sounds delicious! Can’t wait to try them, and then use them to make these brownies! YES! I had no idea either. Don’t buy them unless you plan on getting addicted ;). Thanks, Nat! Oh girl, you really know how to start off the weekend with a bang 🙂 These brownies look all kinds of amazing! These are so fun and festive – love all the layers! Thank you, Kelly. I love making something special to celebrate the weekend! Oh my gosh, all the best parts of Halloween are combined on one plate! I am loving all of the fall treats you’re featuring this week. Have a wonderful weekend! I am all about fall baking at the moment. I just can’t help myself ;). Thank you so much, Elizabeth! Oh my gosh Kathi, these brownies are blowing my mind! I can’t even. 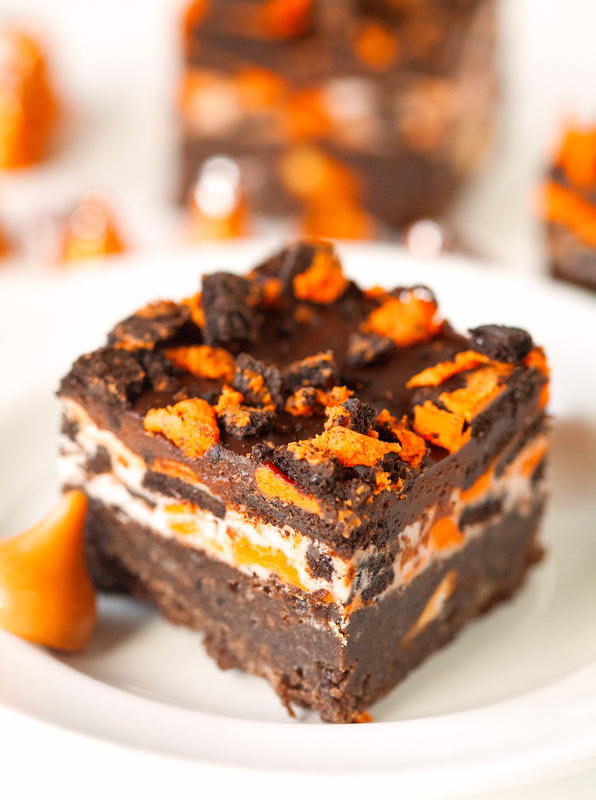 So so gorgeous, especially with the oreos and pumpkin kisses! You just made my weekend 🙂 Pinning! Woah these brownies are out of this world! They look amazing! Thank you so much, Cailee! These might be my new favorite fall treat ;). And thank you so much for stopping by!! Fridays and brownies definitely go together! And whoa do these look good! And so festive for fall! Hope you’re having a wonderful weekend! Thank you so much, Ashley! I had a great weekend – hope you did too! Whoa, you’ve outdone yourself with this one! That looks absolutely scrumptious! HA! I always love reading your comments, Meggan. You are the best. Thank you so much!! Wow! 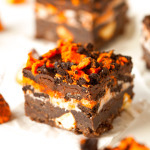 Brownies are my favorite sweet treat and these are totally over the top. I’m going to have to get my hands on some pumpkin spice kisses ASAP! Brownies are my favorite as well, which is why I can’t stop coming up with new versions ;). Thank you so much, Christin!